Wilda Henderson, of Vicksburg passed away on Thursday, August 16, 2018 at the age of 69. Wilda is survived by her husband of 52 years: James; children: Mary Stevens, Jim (Denise) Henderson, Michael (Amy) Henderson; grandchildren: Randi (Jordan), Dusty, Joey, Jeremy, Bailey, Trey, Jacob, Brendan, Drake; great-granddaughter: Riley; special aunt: Sharon (Bill) Painter; sister-in-law: Sue Spencer; and several nieces and nephews. Wilda is preceded in death by her parents: John and Fawn Spencer; brother: John Spencer Jr.; and her sister: Dawn Buell. Wilda grew up in the Upper Peninsula of Michigan and later moved to Vicksburg, MI. She was a long-time member of the lioness club and worked at the Family Fare in Vicksburg for over 30 years. 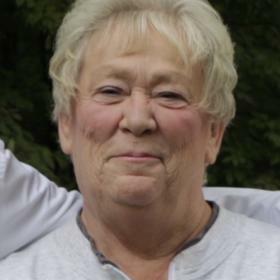 She always loved traveling back to the UP to visit and spend quality time with her family, and she would often work at the camp store on Brevoort Lake. She enjoyed playing card games, especially Yahtzee, and she also loved to read and do crafts, like cross stitching. Her leisure activity included visiting the casino, gathering bear and moose collectables and watching the wildlife from her backyard. Wilda always had a deep, endless love for her family and always cherished every moment with them. She developed a special love for her grandchildren later in life and always supported everything they did, including going to their sporting events and school activities. Wilda was a very special, wonderful woman who will forever be remembered and missed by all who knew and loved her. The funeral service will be held on Wednesday, August 22nd at 11 AM at the McCowen & Secord Family Funeral Home, Rupert-Durham Chapel, 409 S. Main, Vicksburg (269-649-1697). Family will receive friends beginning at 10 AM with services at 11 AM. Please visit Wilda’s webpage at www.mccowensecord.com where you can archive a photo, share a memory, and sign the guestbook. Those who wish may make contributions to the South County Community Services of Vicksburg, MI.